In digital cinema, it’s the lens that determines how the shoot will turn out. These days, video productions are increasingly being shot exclusively with digital cinema cameras built around large-format image sensors. 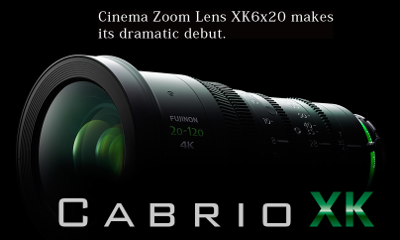 CabrioXK The newest Cabrio in the line, the CabrioXK PL 20-120mm, T3.5 is the 5th focal range in the immensely popular Cabrio line of products. With all the exceptional versatility of the other 4 Cabrios in terms of a removable full-servo digital handgrip and PL mount with integrated LDS and ILink hotshoes. 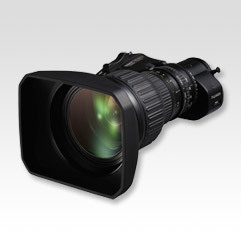 The second 2/3" 4K+ ENG style lens built by Fujifilm to meet the needs of the native 2/3" 4K cameras being deployed today. The Fuji 4K+ lens excels in the three pillars of lens quality being sharpness, contrast and dynamic range providing industry best center to corner lens performance! 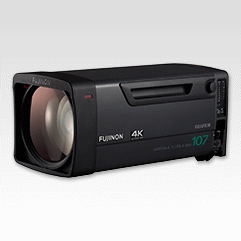 The Original 2/3" 4K+ ENG lens built by Fujifilm to meet the needs of the native 2/3" 4K cameras being deployed today. The Fujifilm 4K+ lens excels in the three pillars of lens quality being sharpness, contrast and dynamic range providing industry best center to corner lens performance! This product has been available and can be found creating spectacular images on 4K productions around the world today! The longest and widest 4K Box lens for Ultra HD Broadcast Applications ever! This new lens shatters the previous focal range restrictions with an amazing 107x zoom from the widest possible 8.4mm starting point. All of this with a F# of 1.7! This lens mounted on 4K cameras being deployed around the world will give live sports and event producers amazing closeup 4K pictures in the field!